Priority Made was the brainchild of Jacob Leidolf and was made possible by the collaboration of AoA Supply, the Pen & Sword Political Pirates collective, and Voices of Liberation. 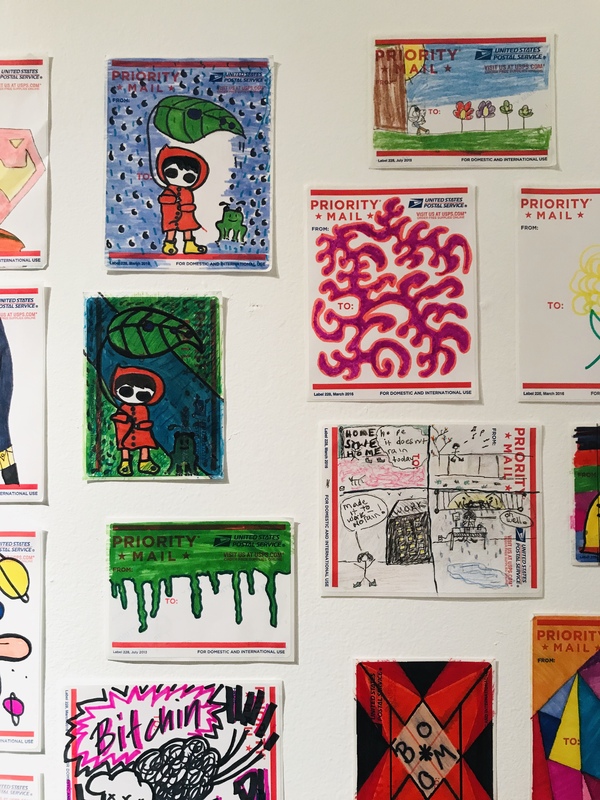 With the Dorchester Art Project providing the space; the show sought to bring together a deluge of styles, perspectives, artists and approaches to the beloved 228 Priority Mail label. Since their inception in 1991, the 228 has always held a special place in the graff writer’s heart. There is something almost magical about the postal sticker—the ubiquity, the iconic USPS colors, the government emblem, the serial numbers, the different designs, and the always low price of Free.99 have made the Priority Mail label the go-to instrument for DIY sticker creation. In the same way that writing your name somewhere it doesn’t belong has always drawn the mischief of makers and creators alike, this show seeks to celebrate the lineage of the Priority Label, it’s collectability, how to read the label and it’s ever adjusting design. From the get, the work assails you—traditional hand styles and familiar names share space with contemporary artists approaching the 228 with their own styles and chosen mediums. The stickers are uniform in their size, but that is where the similarities end. Color, repetition, and subversion are all at play, and seek to guide you across the walls where stark white is greeted by bold colors, sardonic characters, and bold type. Our local youth also try their hand at expressing themselves in the time tried paper box; their results both encouraging and exuberant. This is truly an inclusive medium and the plastic paper forgiving whether using markers, paint, ink, or highlighter. The moments in this show are many: the virtuoso repetition displayed by the forever iconic Imagine876. Miko’s unreal portrait that nods to the 228, but stays true to the artist’s style-not only to caricature but also to myth-making. The tight lettering and sketches of Whups, bringing to mind both elvish script and the work of Swoon. The thoughtfulness of the political statements, the jokes, and the myriad of clever cartoon characters all seek to ground a show that never strays too far into one artistic sensibility or takes itself too seriously. The diversity is one of the shows greatest strengths, with my friends gravitating and choosing wholly different favorite pieces upon the first visit, allowing the visitor to align with the expression of the 228 that best resonates with them. Being the consummate nerd, I gravitated towards the placard that detailed not only the history of the label but also examples of the changes over the years (including some really rare ones! Shouts to the blue labels). What really took me was the back of this space. At the end of the gallery was a large white wall, painted as a massive 228, beckoning the visitor to join in the exhibition and create their own contribution to the Priority Mail lore. The DIY ethos of making your own sticker, and using repetition and ubiquity to create resonance and name recognition, should feel familiar to this crowd, but to facilitate a space for slapping and trying new styles in the presence of some of the areas finest is what truly blew me away. 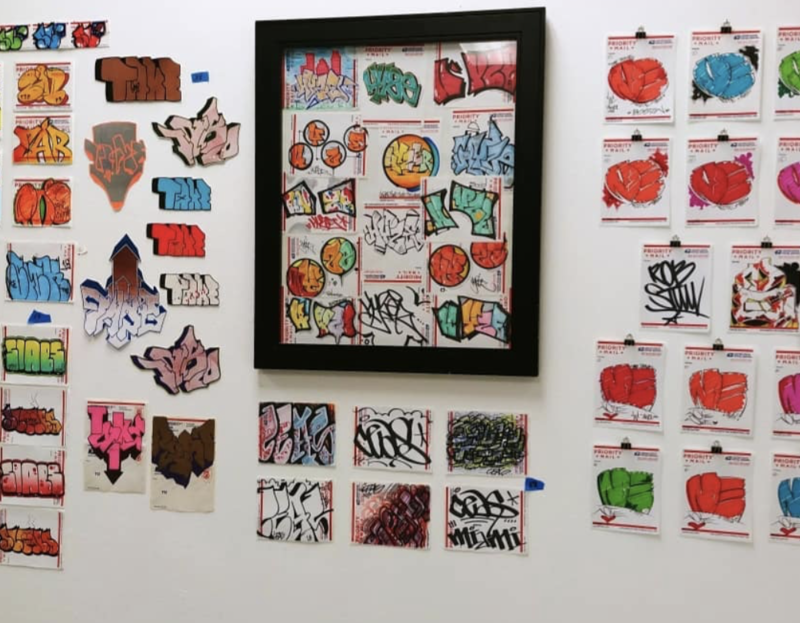 Empowering gallery-goers to add their own stickers was truly a masterstroke, through participation in the magic of graffiti, and in a greater sense street art comes alive. The magic of noticing a work of art that can only be seen at a certain time, or in a certain place, or from a specific angle. The honesty of writing your name and sticking it everywhere to reshape an environment that one found oppressive, or dull. It reminded me of the daring of art, the fun in breaking the rules, and of getting in trouble with your friends. It reminded me that we are all part of the same shared history, and every spot has a story. I could feel it in the air. That old itch coming back. Even to those who had not looked at a whiteout pen in years, and had thought themselves too craven to do hungover throwies with the crew ever again. Come through, and don’t forget the black book too. 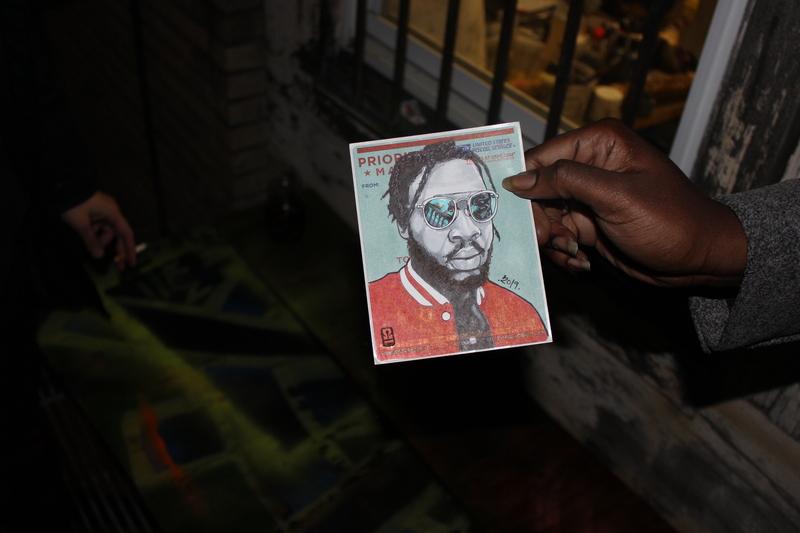 Priority Made is on view at the Dorchester Art Project at 1486 Dorchester Ave through February 9th. A closing reception will be held on the 9th from 6 to 10. When she read her first poem, she really couldn’t believe that people were willing to sit silently through it and clap at the end. It just seemed impossible, but also, secretly, it was the thing she wanted more than anything else—not just to speak and be heard, but to be a part of a community where people spoke and were heard.